Forklifts and their operation are one of the leading causes of injuries across the U.S., including the Northeast Philadelphia area and Bucks County, PA. Forklifts are used in many different industries like construction, manufacturing, warehousing, and more. Forklifts are a commonly used tool in many industries, and need to be operated and maintained in a safe and responsible manner. Sadly, this isn’t always the case, and forklifts can cause injury to bystanders and employees. If you have been injured in a forklift accident, you may be entitled to compensation in either a workers’ compensation claim, or a personal injury claim. For a better understanding of your options in the case of a forklift accident, continue reading below. 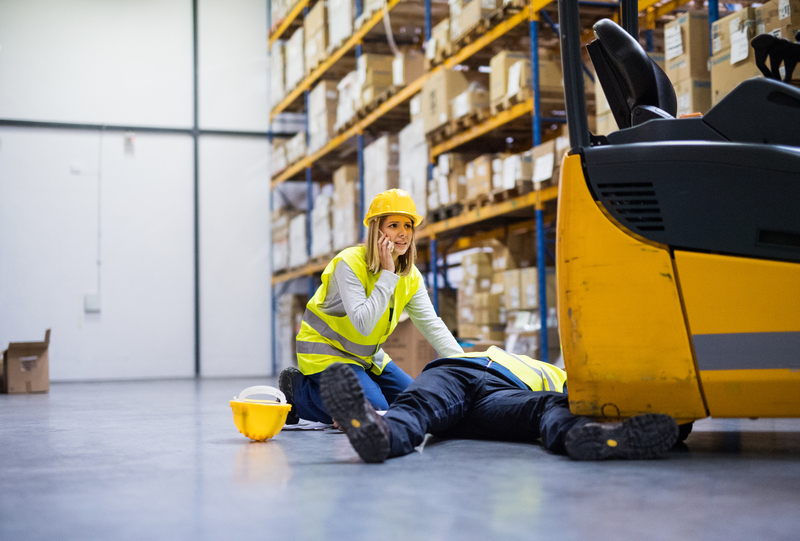 One of the most common types of forklift injuries involves a bystander who is struck by a forklift. Bystanders are considered to be individuals not in the employment of the company operating the forklift. Depending on the circumstances, a bystander can file either a workers’ compensation claim, or a personal injury claim. In the case that the bystander was performing a work related task for their employer (either a delivery to the work-site where the forklift accident took place, or simply traveling to or from work when the accident occurred), the injured party can file a workers’ compensation claim with their employer. On the other hand, you may wish to file a personal injury claim as a personal injury claim will yield much greater compensation awards than a workers’ compensation claim. If you and your Bucks County personal injury attorney believe that you can prove negligence, either by the general contractor of the work-site where you were injured, or by the manufacturer of the forklift, a personal injury claim may be much more favorable for you. If you were injured by a forklift, and were not working for the company operating the forklift, speak with your Bucks County attorney about filing either a workers’ compensation claim with your own employer (if you were performing a work-related task at the time of your injury), or a personal injury claim against the owner of the site, the manager, or the manufacturer of the forklift. Workers who are injured in a forklift accident may have several options available to them. Workers’ compensation laws do not allow you to file claim of negligence against your own employer, but it is possible that other, non-employer parties may be held responsible for your forklift accident. For example, often the people operating forklifts are not employees of the company where they are working, they are employees of a forklift operating company who sell their services to warehouses and construction sites. If this is the case, you would be able to file a personal injury claim against the forklift operation company for negligent operation of their equipment. If, on the other hand, the operator of the forklift works for the same company that you do, workers’ compensation laws will almost always prevent you from filing a personal injury claim against your own employer. That being said, with the help of your Bucks County workers’ compensation attorney, you can file a workers’ compensation claim with your employer, and receive compensation for your medical expenses, and lost income for the time you were unable to work due to your injuries. There is a few, very important distinctions between workers’ compensation claims and personal injury claims. As always, it is recommended that you speak with your Northeast Philadelphia Injury attorney in order to discuss your options in any injury case, and obtain the most informed possible legal counsel for your specific situation. The biggest difference between workers’ compensation and personal injury is the need to prove fault, that is in workers’ compensation claims you do not need to prove fault in order to receive compensation, but in personal injury claims you do. This leads to much larger returns for personal injury claims, but also a much longer and more difficult process. In some forklift accident injury cases, you may only be able to file one or the other depending on the circumstances, so your decision may be much easier. In other forklift accident cases, your case may qualify for either type of claim, and you and your Bucks County injury attorney will have to seriously weigh your options, needs, and risks, and make a decision which type of claim to file. At The Law Office of Kamensky, Cohen & Riechelson, we have helped countless clients across Bucks County and the Northeast Philadelphia area to successfully resolve both personal injury and workers’ compensation claims. Our office has over 30 years of experience working with the victims of accidents of all kinds to recover the compensation they need and deserve to protect their family’s and future, including construction accidents, auto accidents, motorcycle accidents, premises liability, and traumatic injuries of all kinds. We believe that rather than giving our clients elaborate and un-deliverable promises just to get their business, our firm and our clients are better served with honest and true legal advice. By understanding your options, and the benefits and risks involved with any injury claim, you can make informed and confident decisions regarding your future, and feel secure in the knowledge that we will work to secure you the best possible result. To speak with one of our experienced personal injury and workers’ compensation attorneys today in a free and confidential consultation regarding your potential injury or accident case, please contact us online or through our Bensalem, PA office at 215-337-4915.